I take an artistic approach to floral styling, letting the seasons dictate the colours and textures of my designs. My aim is to create natural but exciting arrangements with wild movement and enticing shapes. I feel strongly about supporting the British flower industry and our wonderful growers, who, let's be honest, have a tough time all year round to bring us such an incredible choice of beautiful and scented, (flowers from overseas tend not to have a scent) blooms. You might feel that choosing seasonal flowers for your wedding will limit your overall choice but why not have flowers that will be in season every year on your anniversary? So with every year that passes, you’ll naturally be taken back to your special day. You will meet me to talk about your wedding and ideas. For this initial chat, feel free to bring as much or as little details as you want and together we can start to create something that is going to be unique to you. I will then put together some ideas for you to look over and if you’re happy, I will take a small deposit from you to save the date and once you’re booked in, we can then work out the details of the designs. Nearer the day, we can go to the venue together for a walk through with your planner and finalise the outline of the day. On the day, I will be there to set up and make sure everything is looking great and at some point I will head over to where you are and personally give you your bridal flowers and button holes. All you have to do is enjoy your day! What I can offer as a studio florist, is a guarantee that you will always have the freshest blooms and never adding older flowers that ‘needed using up’. Your wedding will only be made from flowers that were bought specifically with you in mind. I take care of each aspect from the first meeting to the installation on the day. Planning your wedding is a personal experience and I take that responsibility to heart and will make it a fun and relaxed journey from start to finish. I want you to be happy with all the designs and the process so I make sure I’m on hand through-out to answer any of your questions and hear your suggestions. My clients are stylish couples who are excited about the details that bring their wedding to life. 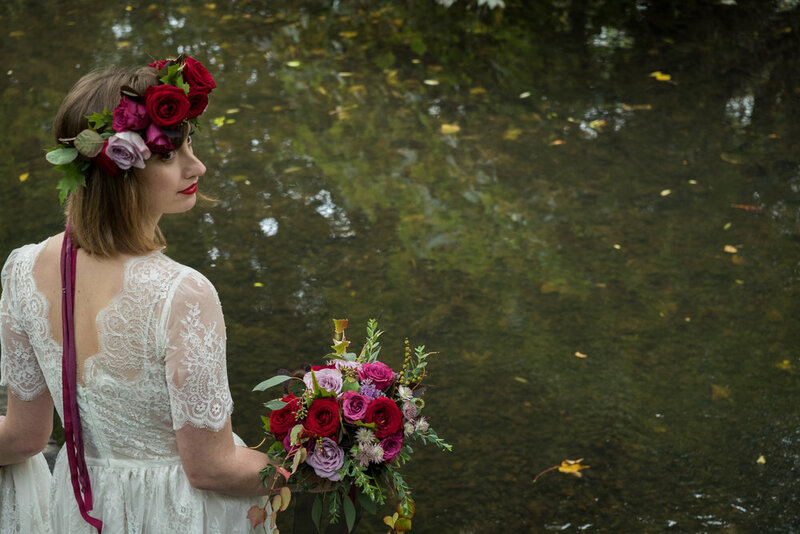 They want their wedding flowers to be an expression of who they are and are looking for their flowers, from the button holes to that maximum impact reception statement piece, to reflect their personality, making their wedding day stand out from the crowd. Follow me on Instagram for photos of weddings, venues and stories about event set up's... aaaand photos of my dog, Wesley... because, honestly, I just can't help it.